Enjoy bona fide Southern hospitality at our Days Inn and Suites Thibodaux hotel. 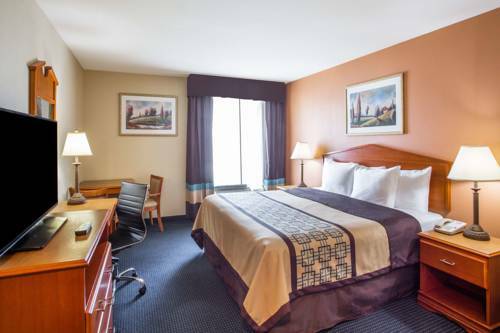 Located minutes from downtown and just 32 miles from Louis Armstrong International Airport, our non-smoking hotel in Thibodaux, Louisiana offers handy amenities and down-home comfort to brighten up your trip. Rise and shine with free Daybreak breakfast, including a selection of hot items and an omelet station. Use free high-speed Internet access to look up local attractions and keep your clothes fresh in our guest laundry facility. Unwind with a swim in our outdoor saltwater pool. For deep relaxation, book one of our Jacuzzi rooms or stretch out in one of our suites. Handicapped-accessible rooms are also available at our hotel in Thibodaux, Louisiana where kids 17 and under stay free with an adult. - J. Ray McDermott, Inc.
- T. Baker Smith, Inc. Visitors to the La Branche plantation will find several unexpected sights, such as the largest pecan tree in Louisiana, the grave of Hitler's horse Nordlicht, and the bathtub of President Zachary Taylor.